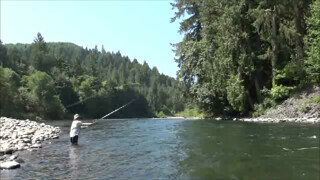 This last Wednesday, I was guiding two wonderful guys who are my most regular clients; with steelhead being the main target of the day, and trout filling in after the heat and sunshine took over. It was predicted to hit 87 degrees on the weather forecast, and I can say that it was higher than that. Also very calm out; so the heat and sun did not let up on you at all. I took my shirt and dunked it under the cold McKenzie River water, wrung it out, and put it on. It would seem like a refreshing idea, but within no time, my shirt heated up and felt like a warm wet towel wrapped around me. Luckily it was bone dry in about 10 minutes anyhow. The heat did seem to affect the fishing, but we luckily got into two fish with the fly rod, and one fish backtrolling a plug in a deep tailout. Yes we occasionally bust out a rod that has a fly reel loaded with 30# backing and 30 meters of 12# test on it with a wiggle wart plug. Occasionally it has saved a day that would have been a skunking, and other times it adds on one to several bonus fish to fight on a fly rod without fly line on it. Anyhow, no need to justify my fly fishing; since I do that firsthand, and have that Rig as an extra tool in the boat. The one particular tailout is super deep and always has fish in it, yet I have never caught a fish in there any other method besides with a plug and backtrolling. I know the drift guys can get them in there, yet I cannot get down with any shooting head or indicator dead drift set up (so far). 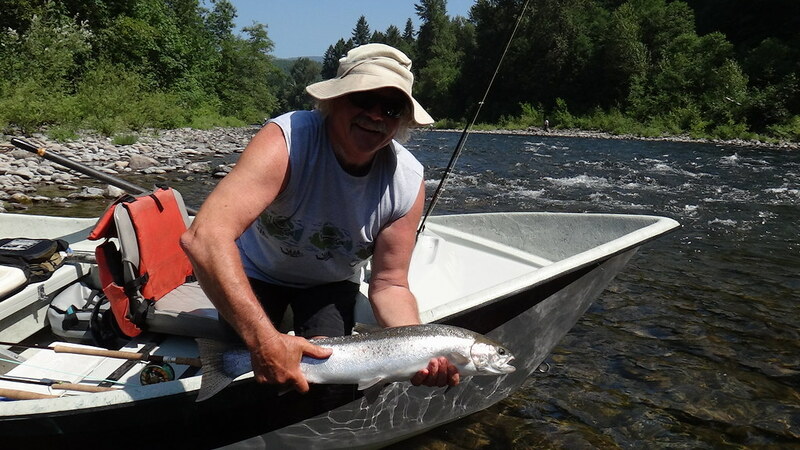 Nonetheless, one of the other fish was hooked up with a Skagit Switch Head with 7.5 feet of T-11 sinking line, and a leech I tied with blue ostrich hearl in the rear and black ostrich in the front. The fly had small dumbell eyes, and about a 4 foot leader of 0X Orvis Mirage Tippet was used off of the sinking tip line. It was taken while working toward the tailout in a deeper run, and the fly was taken hard, but Bruce let out a frustrated sigh when the fish's battle was short lived. Blaine's fish was hooked while drifting down from spot to spot. We were passing by a short run and I was having both guys nymph off the side of the boat with a stonefly nymph and a Trout Bead dropped off of it. The fish took a 8MM Natural Roe pattern with a size 6 hook, and it was fought with 1X Mirage Flouro (I use 0X to the 1st fly and 1X to the second; so you possibly only lose one if you have to break off). The fish stuck on for the whole battle, and we got to enjoy it chrome ocean fresh coloration before sending it back off for someone else to enjoy again. After that the steelhead did not want to play anymore, but having three fish hooked up on a 90 degree bright sunny day and hitting the water at 9am isn't too bad......We also caught a fair number of trout after the steelhead seemed to quit biting, and enjoyed being on the water on a hot and sunny day. At least then you can dunk your hat in the water and get your feet wet instead of being in the city all hot and sweaty!